Probably just as well that I’ve focused my holiday football viewing on life outside the Scottish Football Leagues, given that during my trip open revolt abounded with them. Livingstone were demoted two levels at three days notice, and therefore both Airdrie United and Cowdenbeath had 72 hours to plan out life a division higher than they’d prepared through the summer for. 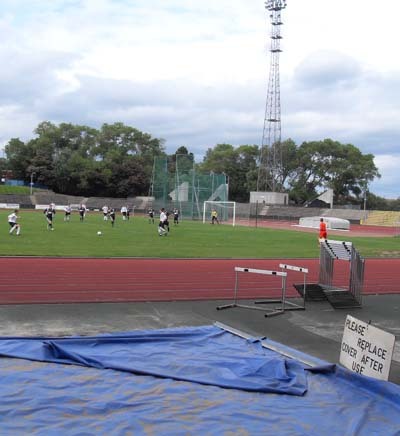 Livingston then appealed the decision, an appeal that was ultimately unsuccessful, meaning their game against East Stirlingshire needed to be postponed, whilst the two eleventh-hour promotees would have to treat their results against Ross County and Arbroath respectively as ‘provisional’. Many, including our chum Steeplejack at the great Gable End Graffiti, have been scathing about Livingstone, for their to-hell-with-consequence business practice, and also for the fact they are very much a Franchise FC for West Lothian. You can read more of his thoughts on his site. Like him, I’m certainly no fan of clubs expecting others to pick up the pieces of their profligacy, nor of those who buy another club’s higher status and transport it away from its heartland, its history and the on-field meritocracy that should be the only measure of bringing success to a club and the town it represents. 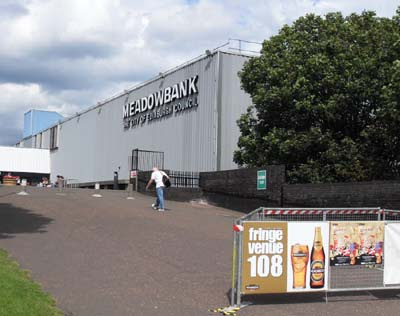 I’m not sure whether it’s appropriate, or inappropriate that on this calamitous weekend that I should be visiting the ground upon which Scottish league football was played until Livi carpet-bagged Meadowbank Thistle’s slot in the mid-90’s. 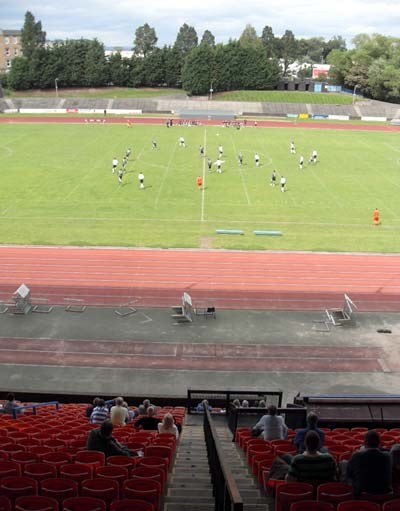 Despite its history though, Meadowbank Stadium is a bit like a sci-fi nerd with tourettes and a penchant for goosing your parents, i.e. a bit hard to fall in love with (apologies to any sweary Battlestar Galactica enthusiasts with busy hands who happen to be reading). Finding your way into it is the first battle, only one turnstile being required and hidden away in the vast expanse of the gigantic stand. Up to the main foyer stroll a number of folks in Judo costume awaiting a lesson, much fewer are aimed in the direction of that turnstile to hand over the £4 in. This may partly be because the club notice board outside is still advertising the fixture of a fortnight prior and even then only on a piece of A4. Once inside, I appear to be one of only four people here to share a 7000 seat stand. The flip-up bit of the seats is larger than most you see which makes looking down at them rather like looming over a large brace of ducks staring at a crack in the roof. Around the other sides of the ground are some terrace steps, sadly out of bounds, and the large leisure complex. The big screen at one end hints at the bigger days, the athletics meets and such, that draw in the bigger crowds. 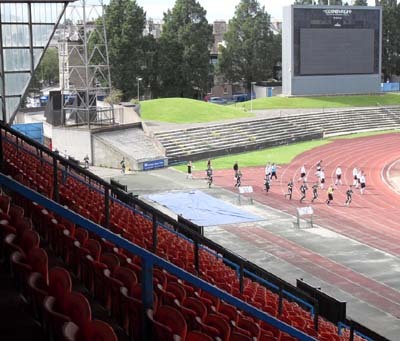 This place was, after all, built to host Commonwealth Games’. With no tannoy playing tunes, the sound of high-octane dance and a fitness instructor barking their “woo yeah…one more time” instructions to their almost certainly moist and apple-cheeked class can be clearly heard on the breeze. There really isn’t much to catch the eye around the place. Hurdles litter the edge of the running track, the ‘dug-outs’ (i.e. a couple of benches and a plastic chair) sit at unkempt angles on the half-way line, whilst a sweet wrapper flickers listlessly in a foot hole in the long-jump pit. As the game kicks off it becomes clear that atmosphere-wise, it’s not exactly going to be as Russ Abbot would favour it. The screaming incandescence of the managers is so far distant on the other side of the stadium that it feels like a family row happening two streets away intruding awkwardly on a minute’s silence. Twelve minutes in, Edinburgh City score the only goal they will need to beat their studious neighbours, a beautifully judged cross into the six yard box where Ian McFarland steals into to knock a header past the stuck fast keeper Tait. McFarland misses an even easier chance just prior to half-time when another cross on the six yard line spoons of his ankle and flips wide of the post. The second half began with a resurgent effort by University but nothing to overly worry the home side. In truth, it was poor advert for the East of Scotland League. The most intriguing aspect of the day, for me, was a message in biro written above the sinks in the gents toilet, which suggested that the ground’s previous tenants are gone, but not forgotten: “MTFC on the way back, ECFC on the way to bankruptcy”.